Warehouses, freezer units and store rooms are often expensive square metres that you want to organise as efficiently as possible. With our plastic custom-made shelving every centimetre is utilised. Every rack is custom-made and can be fitted exactly into the space. 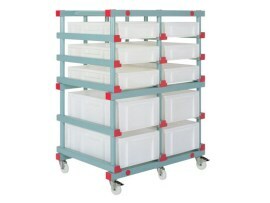 Plastic racks are also lightweight, stable easy to clean hygienically. 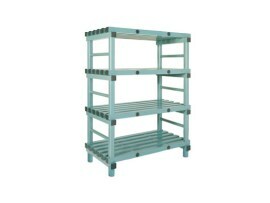 Storage racks are for this reason often used by bakeries, poultry plants, catering trade companies and commercial kitchens, but also by swimming pools and sports centres. 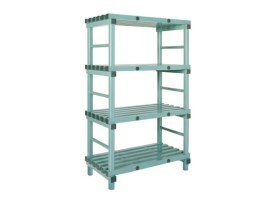 With a temperature resistance from -40°C to +80°C our freezer shelving is highly suitable as a freezer unit rack. 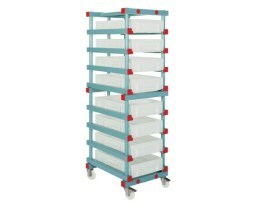 The plastic shelving is available in Euro shelving, in Gastro shelving and in Nautical shelving for shipping. 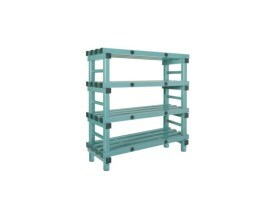 A plastic rack can be extended for example with wheels, plastic bins and work surfaces into a plastic work surface or bin rack. With our plastic shelving the possibilities are endless. 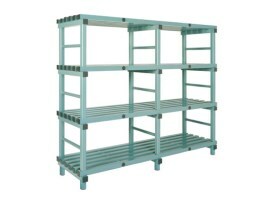 More information about shelving and racks?